Dr. George Zavoico, a senior equity analyst and senior vice president with B. Riley FBR, has more than 10 years of experience as a life sciences equity analyst writing research on publicly traded equities. His principal focus is on biotechnology, biopharmaceutical, specialty pharmaceutical, and molecular diagnostics companies. Previously, Zavoico was a senior equity analyst at JonesTrading Institutional Services LLC, a senior equity research analyst in the healthcare sector at MLV & Co., and an equity analyst at Cantor Fitzgerald and Westport Capital Markets. Prior to becoming an equity analyst, Zavoico established his own consulting company serving the biotech and pharmaceutical industries, providing competitive intelligence and marketing research, due diligence services and guidance in regulatory affairs. Zavoico began his career as a senior research scientist at Bristol-Myers Squibb Co., moving on to management positions at Alexion Pharmaceuticals Inc. and T Cell Sciences Inc. (now Celldex Therapeutics Inc.). Zavoico has a bachelor's degree in biology from St. Lawrence University and a Ph.D. in physiology from the University of Virginia. He held post-doctoral fellowships at the University of Connecticut School of Medicine and Harvard Medical School/Brigham & Women's Hospital. He has published more than 30 papers in peer-reviewed journals and has coauthored four book chapters. He received The Financial Times/Starmine Award two years in a row for being among the top-ranked earnings estimators in the biotechnology sector. Why should investors keep an eye on these twenty small-cap biotechs in 2017? 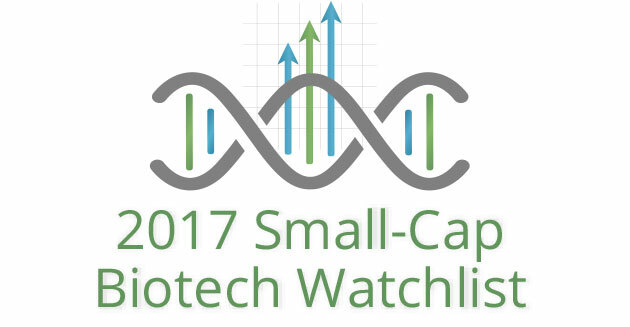 The analysts who made the selections for The Life Sciences Report's 2017 Small-Cap Biotech Watchlist laid out their rationales at the Watchlist's launch at the Biotech Showcase in San Francisco on Jan. 11. "DRRX's new formulation of oxycodone, Remoxy, has made it very difficult for abusers to extract the active ingredient to get a concentrated hit of the pill's payload." "SNSS is going after registration for vosaroxin in the European Union." "After seeing the complete data set from ASSURE and other studies of RVX-208, a lot of key opinion leaders are behind RVX's drug candidate." "We expect to see reports on safety and efficacy from the first cohort of AST's cervical spinal cord injury trial starting sometime in Q2/16." "Durable survival was reported in AST's small Phase 2 trial in acute myeloid leukemia." "We are maintaining our Buy rating for AST." "We are initiating coverage of AST." "INO has a broad platform that includes an IL-12 DNA vaccine and other DNA vaccines for both cancer and infectious diseases."